Ron and Mary sat on the rug in front of the fireplace enjoying their glasses of wine and feeling toasty in front of the abundant flames that warmed the entire room. “Do you really mean that?” Ron asked. “That’s a mean thing to say.” Ron said. “I think he’s way above average,” Ron said. I almost hesitate to comment since my reply would be a robust hand clap. I couldn’t agree more . . . I think a lot more do agree than don’t, but things are moving so fast, that I’m fearful that there’s nothing we can do to stop the momentum and, before long, we are going to be facing a very different country than we had before the 2016 election. I hope I’m wrong, but I’m worried that I’m not. I heard a rumor that they are asking parents to pay for the DNA to help find their kids. Talk about MEAN. Wow. Yes, I heard that too. I also heard that if anyone wants to submit a formal complaint to the FCC, they’re going to have to pay $200+ to file it. Trump is trying to turn our government into a for profit business in order to fund the tax cuts for the wealthy and for corporations. Ha ha ha ha ha. I think he’ll be getting a call from her divorce lawyer in the morning. — Honey, that was great, what made you change your mind?? — Oh, the Wall, hon. I’m pushing 43, and if I lose you, it’s cats and wine until eternity stops like a clock. I wonder how many divorces have been caused by the current political divide. 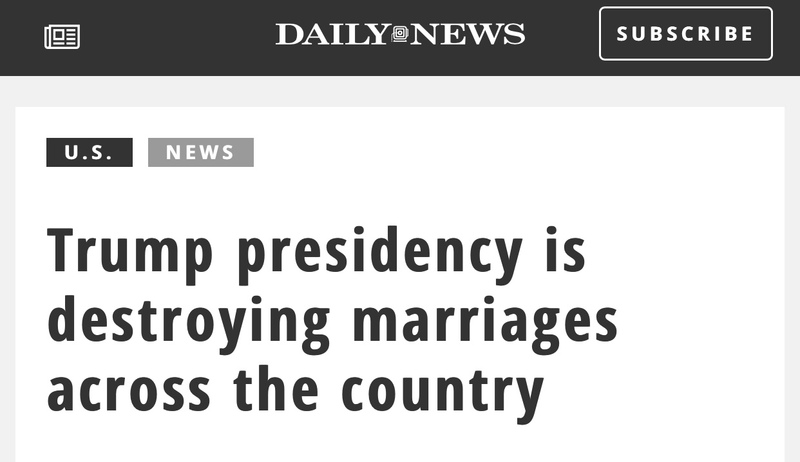 Google “how many divorces has trump caused” (without the quotation marks). I only had a chance to do a bit of quick scanning, but apparently quite a few (I’d have to do more reading to verify this). I can’t think of a time when my wife and I argued over politics. I’m not a fan of Trump’s and often find his behavior incomprehensible, but my wife being Jewish and a supporter of a Jewish homeland (which I am, too), Her litmus test for a POTUS is his policies toward Israel, and Trump passes that test for her. It’s not enough for us to get anywhere near divorce court for, not after 35-plus years of marriage. Unfortunately, too many voters have a single issue litmus test for the candidates they support. No offense to your wife, but Trump’s policies towards the US, Russia, NATO, immigration, taxes, healthcare, and decency and honesty are more important to me than his policy toward Israel. I think Netanyahu is as despicable as is Trump. And I’m generally pro-Israel. They were having an enjoyable evening till Ron brought up Trump. That’s what happens when you bring up Trump. I don’t think she will file a divorce because of Trump.